Merry belated Christmas! 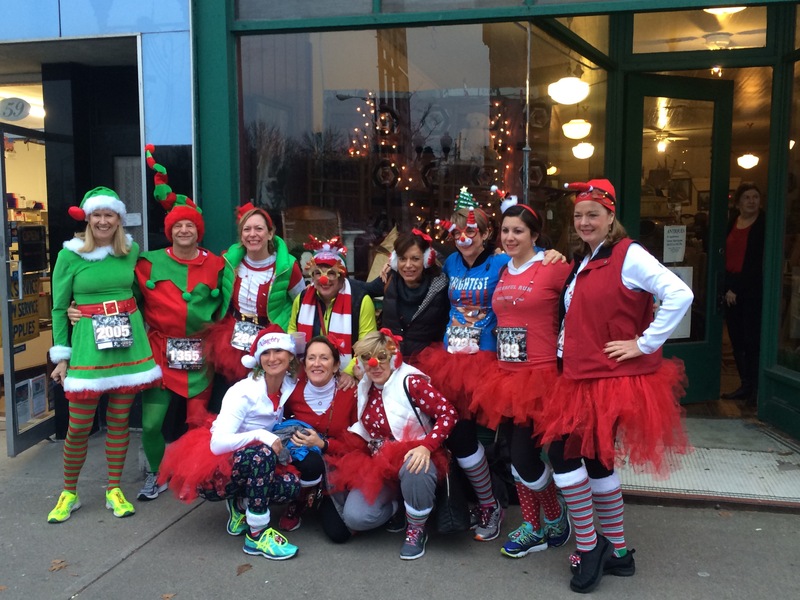 We started our holiday season with going upstate to Seneca Falls to celebrate Ben’s birthday and to do the It’s a Wonderful Run 5K. I’ve wanted to do this race ever since I found out about it because the movie, It’s a Wonderful Life, has a lot of sentimental meaning. 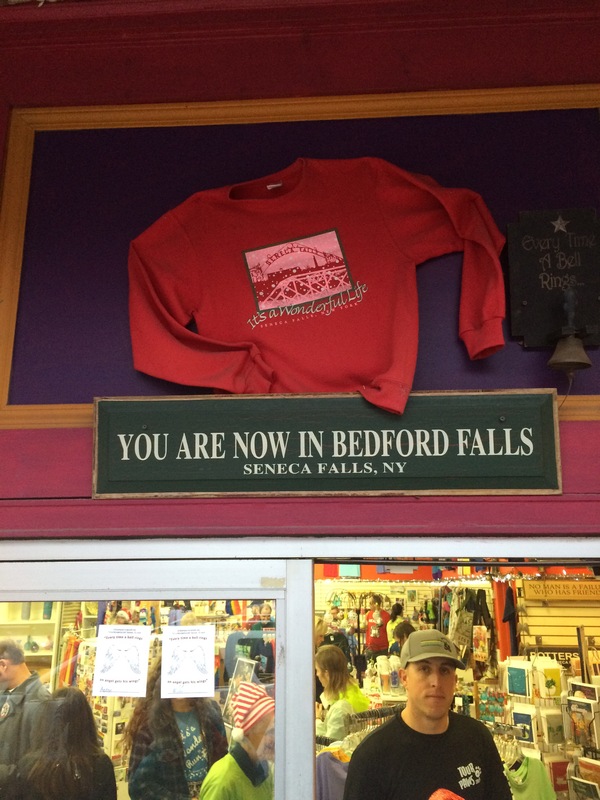 Seneca Falls is famous for being the site of the first women’s rights convention in 1848 and for being the inspiration of Bedford Falls for Frank Capra’s It’s a Wonderful Life. Ever since the clusterf*ck of a bib pick up that we experienced at the Oyster Bay Turkey Trot, Ben and I have an extra appreciation for efficient service. We approached the community center with trepidation because it looked like there was a long line snaking out of the door, but it turned out to be nothing more than a crowd huddling around the entrance. We went inside, stood in a short and fast line, and left with our bibs. As an additional nice touch for the race’s theme, we were given a small bell to wear with our bibs. The race atmosphere was festive. At different spots around the race, speakers were set up to play music. Spectators were out to cheer for us and a few even had a roaring bonfire to keep them warm. My favorite stretch of the race was the last 1/3 where we turned onto the main street to run through Seneca Falls to a thick crowd of cheering fans. My goal for this race was run a sub-24 5K. I didn’t want to start too fast, so I was diligent about running a 7:30 for the first mile. Garmin beeped that the first mile was 7:36. Great! I was excited about not running too fast. After the first mile, I could feel myself getting really tired and slowing down. The second mile, I slowed to 8:16. After that, everything just fell apart for me. I got a terrible side cramp. My legs felt like they were filled with concrete. Honestly I felt like quitting, but I knew I would still have to get myself to the finish line. Since I only had about a mile left, I decided to run the mile slowly, enjoy myself, and finish the race. It was disheartening seeing so many people pass me, but there wasn’t anything I could do. If I didn’t have such a terrible cramp, I would have really enjoyed the nice steep downhill to the finish. Several runners flew right by me! I finished in 25:33, which is the slowest 5K time that I’ve had in two years. While I’m bummed at not having a good race, these things happen and I’d rather I have a bad race at a non-goal race than at a goal-race. The post-race spread was very generous for a 5K. I drank lots of hot chocolate and helped myself to cookies, while Ben stuck to coffee to warm up. 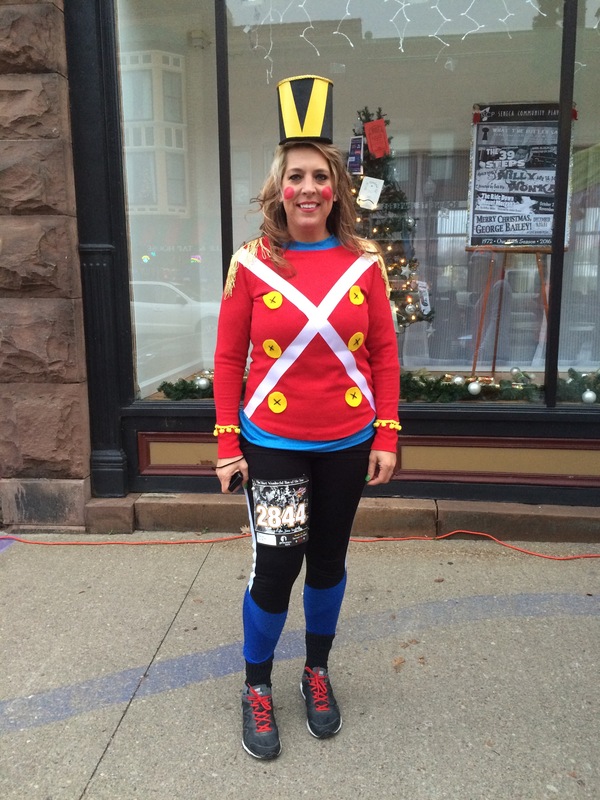 It’s a Wonderful Life 5K is a fun holiday-themed race. This is the biggest 5K that we’ve ever been in, almost 4,000 runners. Ben was amazed that so many people came out. While Ben still thinks it’s a crazy that we drove 4.5 hours to do a 5K, I thought the race was fun and well worth the effort of driving from New York City. 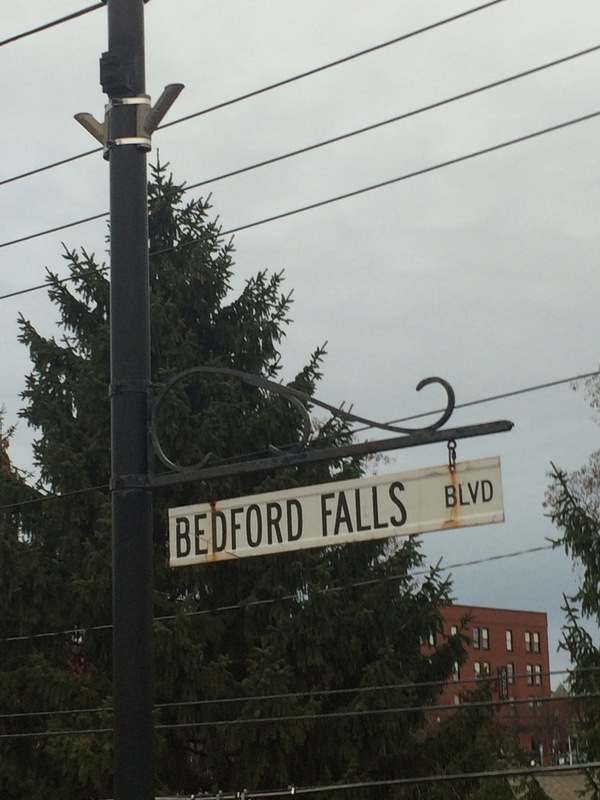 Thank you, Seneca Falls Bedford Falls, for bringing the holiday cheer! What a fun race. Sorry it didn’t go as planned but you still ran a great one! Thanks for the words of encouragement, Sarah. It’s not a bad time considering the cramps. 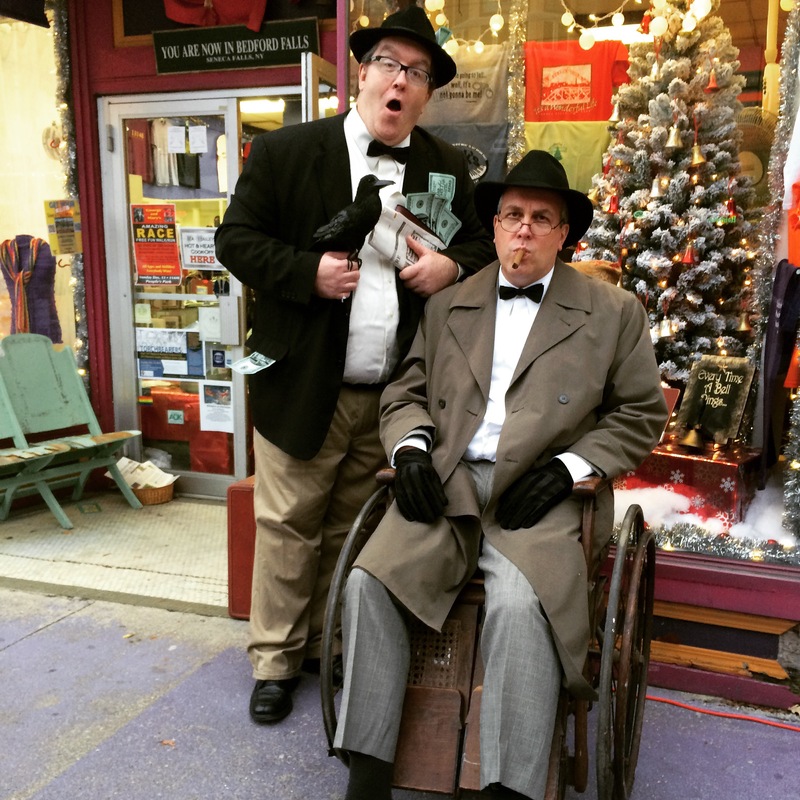 I love It’s a Wonderful Life! What a fun race! Sorry to hear that it wasn’t your race. I agree, at least it wasn’t your goal race. Makes such a difference. Yup! It makes the disappointment easier to take. Oh man, sorry about the cramp, especially since it kept you from enjoying the downhill finish (!!). The rest of the race sounds cool though! The cramp was weird considering I was careful not to eat much at lunch and have several hours of digestion (I discovered I digest very slowly). Eh, what can you do? 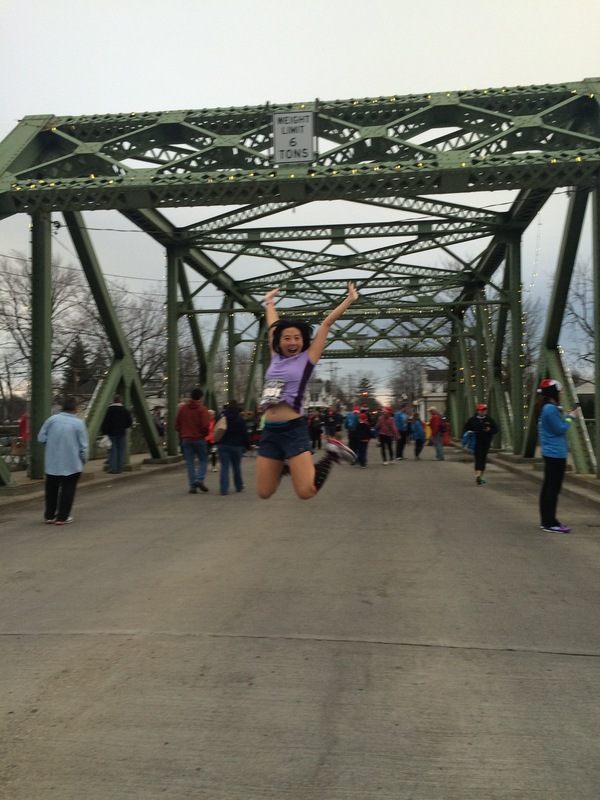 The race itself was fun and I loved the town. It was neat to walk around before the race to see the signs in tribute to the Seneca Falls convention. You do so many fun and cool races! Love it! I have access to very few races unless I travel for days (well, several hours) so I’m always stoked to read about your neat runs! I’m nuts enough to travel hours for a 5K. It drives Ben a bit crazy but he puts up with it. I’m lucky that NYC has such a vibrant running community.